It is election time again, so where do the political parties stand on unconventional gas? The Labour Party, the Liberal Democrats and the Green Party would either ‘ban’ or ‘oppose’ fracking. UKIP energy policy supports fracking and is firmly based in head in the sand climate change denial nonsense. However, there is no UKIP candidate standing in North East Somerset so we don’t need to consider it further. The Conservative Party policy reiterates David Cameron’s desire to mimic the US Shale Gas experience citing lower energy prices, energy security and carbon benefits of displacing coal. It also states that ‘non-fracking drilling’ will be treated as ‘permitted development’, meaning that planning permission would not be needed. Geographically England is nothing like the USA and a US style fracking ‘revolution’ is not compatible with ‘maintaining public confidence’ on account of the scale of the operations required to bring about such a retrograde revolution on a densely populated island. Belief that the US experience can be replicated in England is naive and widely recognised as such. Coal will have disappeared from the UK energy mix before fracking may get going so fracked gas will either displace imported gas or renewables, with no emissions benefit. 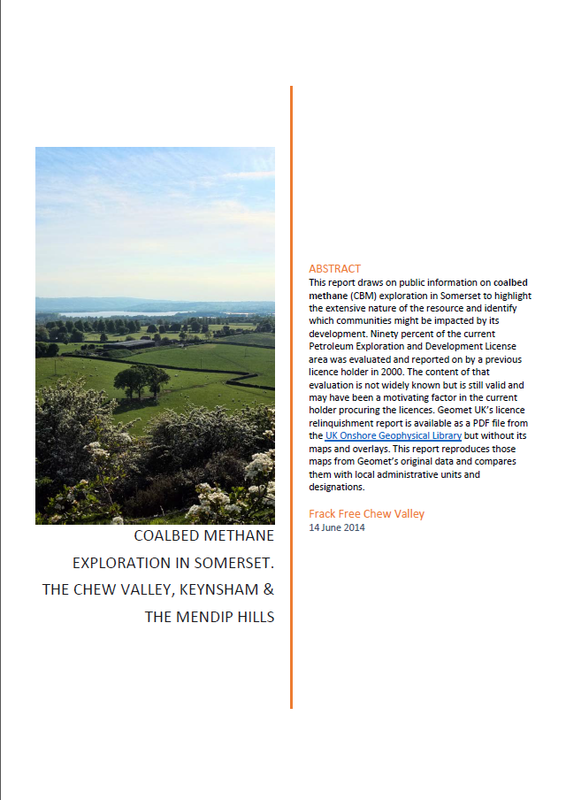 In the Chew Valley Coalbed Methane rather than Shale Gas is the mineral of interest. The definition of ‘fracking’ in the Infrastructure Act is so specific to shale that it does not cover the development of Coalbed Methane whether fracking takes place or not. Making ‘non-fracking’ drilling ‘permitted development’ sweeps away planning considerations in relation to unconventional gas in this rural economy. The 300 gas wells that Coalbed Methane specialists GeoMet Inc estimated the Chew Valley and Mendip could ‘accommodate’ would therefore not need planning permission! This is the extraordinary policy that the Conservative Manifesto sets out and wants you to vote for. Whilst there is no extant exploration licence in the Chew Valley area at present it is quite conceivable there could be again in the future. The discovery and extraction of shale gas in the United States has been a revolution. Gas prices have fallen, driving growth in the American economy and pushing down prices for consumers. The US has become less reliant on imported foreign energy and is more secure as a result. And because shale is cleaner than coal, it can also help reduce carbon emissions. We believe that shale energy has the potential to do the same thing in Britain, and could play a crucial role in rebalancing our economy. We will therefore develop the shale industry in Britain. We will only be able to do so if we maintain public confidence in the process, if we uphold our rigorous environmental protections, and if we ensure the proceeds of the wealth generated by shale energy are shared with the communities affected. We will legislate to change planning law for shale applications. Non-fracking drilling will be treated as permitted development, expert planning functions will be established to support local councils, and, when necessary, major shale planning decisions will be made the responsibility of the National Planning Regime. We will set up a new Shale Environmental Regulator, which will assume the relevant functions of the Health and Safety Executive, the Environment Agency and the Department for Business, Energy and Industrial Strategy. This will provide clear governance and accountability, become a source of expertise, and allow decisions to be made fairly but swiftly. Finally, we will change the proposed Shale Wealth Fund so a greater percentage of the tax revenues from shale gas directly benefit the communities that host the extraction sites. Where communities decide that it is right for them, we will allow payments to be made directly to local people themselves. A significant share of the remaining tax revenues will be invested for the benefit of the country at large. Labour will ban fracking because it would lock us into an energy infrastructure based on fossil fuels, long after the point in 2030 when the Committee on Climate Change says gas in the UK must sharply decline…[The Conservatives] have allowed fracking in national parks. We will oppose ‘fracking’ because of its adverse impact on climate change, the energy mix, and the local environment. We will introduce a ban on fracking. Table shamelessly summarised from CarbonBrief.org. Visit CarbonBrief.org for a full analysis. It has recently been reported in the local press that the Chew Valley, Bath and Mendip will remain free from fracking for Shale Gas. This is based on an announcement by Ben Howlett MP (Bath) following a meeting that he and James Heappey MP (Wells) had with the responsible Secretary of State the Rt Hon Andrea Leadsom. Ms Leadsom wrote to Mr Howlett saying that “Bath and the surrounding areas are not located in the British Geological Survey’s ‘shale prospective area’. NB – Mr Jacob Rees-Mogg doesn’t seem to have been invited to Ms Leadsom’s tearoom surgery. Ms Leadsom’s letter to Mr Howlett is reproduced on his web site and is reproduced below in blue italic. Mr Howlett commented “As the Minister, Andrea Leadsom, said in her response to me I regret that this situation has been unclear both to me and my constituents and am relieved and reassured by her response“. However, Ms Leadsom seems to have persuaded Sir Humphrey Appleby GCB, KBE, MVO, MA (Oxon), (a “master of obfuscation”) to draft the letter for her as it is simultaneously both truthful and utterly disingenuous. Let’s see what Sir Humphrey had to say and whether what was unclear is now clear and whether we can also feel “relieved and reassured”. Not a good start. Why was the conversation about ‘shale reserves’ rather than the ‘coalbed methane resources’ that the gas companies have been searching for in this area for the past 20+ years? These companies (include Pendle Petroleum in 1985, Union Texas Petroleum Inc in 1995, GeoMet Inc in 2000 and UK Methane in 2014) were all looking for CBM according to the licence applications and relinquishment reports filed in Sir Humph’s filing cabinet. Considering that these companies all delivered their reports to Sir Humph’s Department saying they were looking for CBM it is odd he didn’t bother have a peek to find out and so save embarresment. Also Shale Gas ‘reserves’ (what can be technical and economically extracted) certainly don’t exist because the economic value of any Shale Gas in the area have certainly not be calculated. The dextrous use of the word ‘reserve’ rather than ‘resource’ is a careful double blind to hide behind. So they were discussing something that hasn’t been calculated (reserves) for something that isn’t of primary interest in the area (Shale Gas). Of course Sir Humph knows all about this because his Department has published a note on this very point in order to prevent, rather than create, confusion – Resources vs Reserves: What do estimates of shale gas mean? And what about the tearoom cake reserves? So what? The companies are not primarily looking for Shale Gas. Opps – there is the word ‘resource’ instead of ‘reserve’. This is because BGS has got a map of Shale Gas resources but it hasn’t got a map of Shale Gas reserves – because it hasn’t calculated any. The highest level of protection is afforded to hydraulic fracturing for Shale Gas at the exclusion of CBM. The definition of “associated hydraulic fracturing” and related protection in the Infrastructure Act 2015 is specific to shale and stuff “encased in shale”, which does not include coal – as confirmed in writing to us by Sir Hump’s very own Department. PEDL 227 covering the most prospective area for CBM was not available in the 14th Licensing Round because the previous licence hadn’t been relinquished in time. There is nothing stopping the Bath and Mendip area being licensed again in the 15th Licensing Round if anyone were interested – as it has been in the past. Sir Humph obviously hasn’t looked at the 2008 PEDL licence applications or the relinquishment reports otherwise he probably wouldn’t have even drawn attention to them considering what they contain – a plan to comprehensively extract the entire hydrocarbon resource in the area using a combination of fracking, mining and underground coal gasification. Note the use of the word ‘reserves’ again – there aren’t any Shale Gas ‘reserves’ because they haven’t been calculated and nor have the ‘resources’ from which you would calculate the ‘reserves’. What has been estimated by GeoMet Inc and others is the CBM ‘gas in place’ – i.e. the CBM ‘resource’ from which you might calculate a CBM reserve. The recent announcement on fracking don’t apply to CBM anyway. Ah, right. Thirteen blocks in west and east Somerset are being considered as part of the 14th Licensing Round even though they are also not in the BGS shale gas prospective area either. Err, so they must be being licensed for something else other than shale gas, something like CBM and Shale (Oil) – as stated in Sir Hump’s list of licences. So, not being in the BGS shale gas prospective zone is a good thing in Bath, but not in any way relevant in Weston, Frome or the Forest of Dean – based on the same criteria of not being in the BGS shale gas prospective zone (Ed. Has Sir Humph got that right, it sounds like nonsense?). Sir Humph’s Department has actually licensed 1,200 square kilometres in the Forest of Dean (CBM), Wiltshire (CBM) and the Somerset coast (Shale but not Shale Gas) that is not in the BGS Shale Gas prospective area. So the talk about not being in the BGS shale gas prospective area and the careful use of the words ‘reserve’ and ‘resource’ is just a meaningless ruse that only Sir Humph could articulate to make everything sound OK? Sir Humph also forgot to mention that the Habitats Regulations Assessment consultation had three possible outcomes all of which resulted in the licenses being issued, no matter how sensitive the area or the consultation response. Sir Humph is fixated on only articulating “Shale Gas” at the exclusion of the “other forms” such as CBM and even Underground Coal Gasification. Why would Sir Humph not want to say CBM or “Underground Coal Gasification”? Phew, so now we know that there are no shale ‘reserves’ in the area (the ones that haven’t been calculated, so how could there be any?). But what about the CBM ‘resources’ – the ones that have been calculated and the ones that UK Methane recently said in their relinquishment report (filed in Sir Humph’s office) were “probably prospective” and which any company can apply for an exploration licence for the next time around. Glad that Sir Humph has cleared up that confusing mess by providing a carefully worded explanation of what isn’t significant in this area. Pity he didn’t mention anything that was of primary interest even if it isn’t covered by recent reassuring legislation. Bernard: “But surely the citizens of a democracy have a right to know“. Sir Humph: “No. They have a right to be ignorant. Knowledge only means complicity in guilt; ignorance has a certain dignity“.